At directferries.co.uk you can plan, compare and book your ferry to Gulf of Napoli sailing to the port of Capri quickly, easily and securely online. Not only will you get a ferry price for your chosen sailing but we’ll also show you prices for ferries to Capri around your preferred departure time as well as sailings to alternative destinations to ensure you get the best available price for your trip. 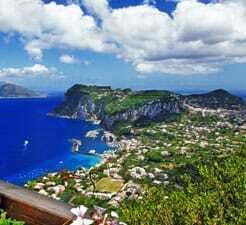 It really is simple to save on your ferry to Capri with directferries.co.uk. All you have to do is select your place of departure, ferry route, number of people travelling on the ferry to Capri and hit the search button. We booked our SNAV tickets online via Direct Ferries and the instructions emailed to us told us that we had to check in at the ticket office no later than 30 mins prior to departure. We made sure we were at the offices well before this time however, the SNAV ticket counter never actually opened...At around 20 mins prior to departure we approached another suppliers ticket counter and they were able to help us in printing a boarding pass. The ferry itself was fine, left and arrived on time, the facilities on board were also good. Easy booking and paying on line. Exchanged booking form at port for ticket. Short distance, but efficient.